Tampa is ranked among the top 10 cities in the world for investing in residential real estate. And with the city continuing to flourish, Tampa’s real estate investment market remains hot. Tampa has a proven track record as a premier location for real estate investment. Tampa and greater Tampa Bay are recognized as one of the best places to live, while making up one of the most populace statistical areas in the Southeastern United States. As home to many of Florida’s retirees, rents in Tampa have bounced up and down a little, but have remained basically flat the past three years. The Wall Street Journal’s ‘Market Watch’ lists Tampa as one of HomeVestors’ top 10 markets to invest in rental property. The return on that is some of the best investments people have ever had. The city of Tampa ranks as the third-best city in the country to find a job, trailing behind Fort Worth, Texas and Washington, D.C., according to a 2014 analysis by Wallet Hub. Tampa is home to many start-ups and family-owned businesses, as well as global companies like Amazon, HSN and Microsoft that provide great jobs. And healthcare in Tampa Bay is extraordinary, not only providing great jobs but also contributing to an outstanding qualify to life. Education in Tampa is also top notch featuring the University of South Florida, the University of Tampa, and many other technical and community colleges. All of these, along with primary and secondary schools, contribute to the high demand for jobs in addition to a high quality of life. Business growth in Tampa is fueling residential real estate investing, as the demand for rental housing continues to grow. People love to live in Tampa, evidenced by the commerce in Tampa Bay and the rich social life enjoyed by residents. Forbes ranked Tampa as one of the best cities for the outdoors, and the NYU newspaper Washington Square News ranked Tampa as a top city for “twenty-somethings” in 2004. Tampa also ranks as one of the most popular American cities based on where people want to live, according to a 2009 Pew Research Center study, and Tampa is ranked as a “Gamma+” world city by Loughborough University. Tampa Bay’s growing population of more than 4,000,000 residents and the demand for rental property has resulted in a steady increase for monthly rents across the board. 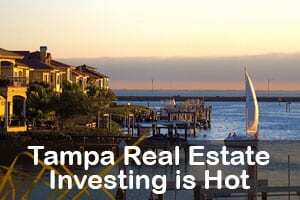 Residential real estate investing in Tampa remains hot. The high demand for real estate rentals with the steady increase of monthly rents makes Tampa one of the best places in the world to invest in real estate. To get started investing in real estate with Graystone Investment Group, fill out our investor profile or contact us via phone or email.